My name is Felipe, and I'm currently working on a crowd-sourced book on cRPGs. 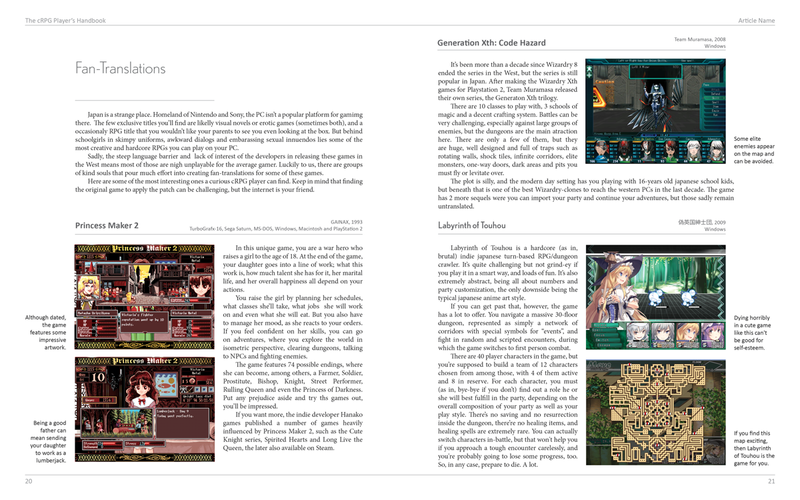 After organizing the RPG Codex's Top 70 list, I decided to expand that into a full blown book. 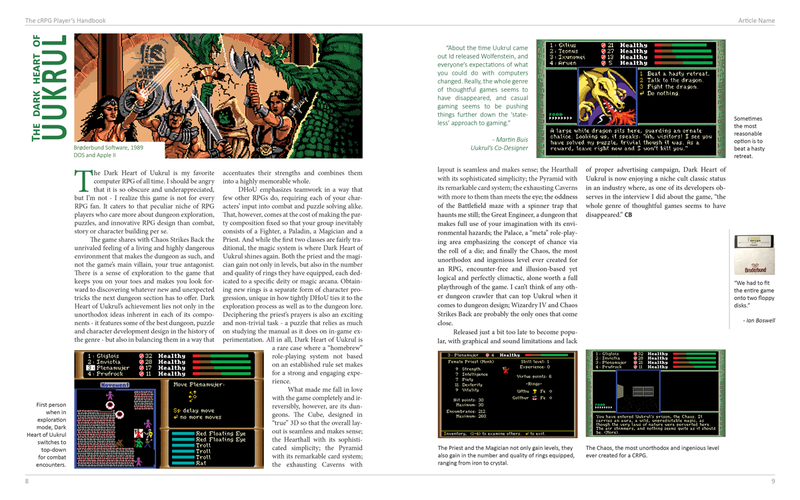 The idea is to feature in-depth reviews of over 250 great cRPGs in chronological order, from Akalabeth to Might & Magic X, plus interesting articles on the genre and interviews. 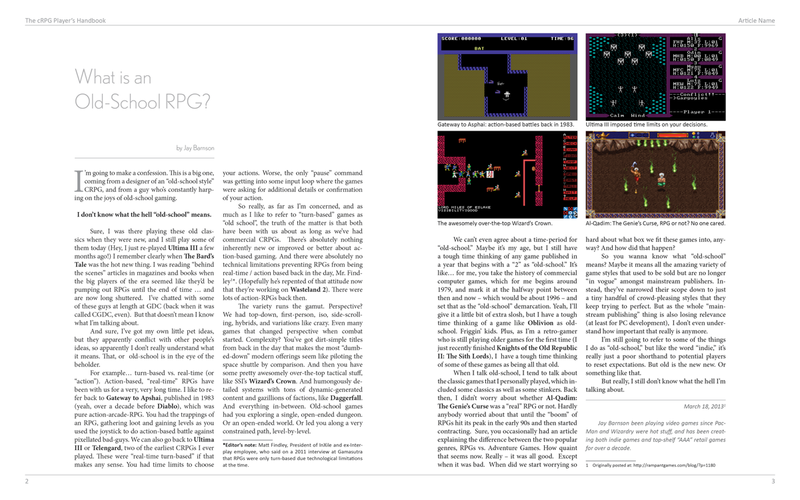 All that written by RPG fans from all over the world, compiled into a beautiful book with big a colored screenshots. It is a book showing what the genre has best, and how people enjoy them. A book that every review that you read you will see that it was important for the reviewer and want to play the game he just talked. So far I've got some big developers in, like Tim Cain, Chris Avellone, Josh Sawyer (Obsidian has been very supportive ), Ian S. Frazier and Colin McComb. I also got full support and access to the content of forums like the RPG Codex and RPG Watch (including some stuff from RPGdot), DJ Old Games, some indie developers like Iron Tower Studios, Sinister Design and Rampant Games, as well as bloggers such as cRPG Addict and modders like Durante and Wesp5. The entire project is entirely non-profit, so the final e-book will be freely available for download, under Creative Commons and all that. And if everything goes well I intend to make a paperback print also available, fully colored and in high-quality print, for those that want one. Non-profit as well, of course, sold at cost price. I'm looking for fans willing to write a review of one or two of the listed games still unassigned. You can, of course, also suggest games that should be added. There are two kinds of reviews, the ones with one page and the ones with two. These are displayed on the list. If you think that the game you're writing about needs 2 pages instead of 1, contact me and we'll discuss it. 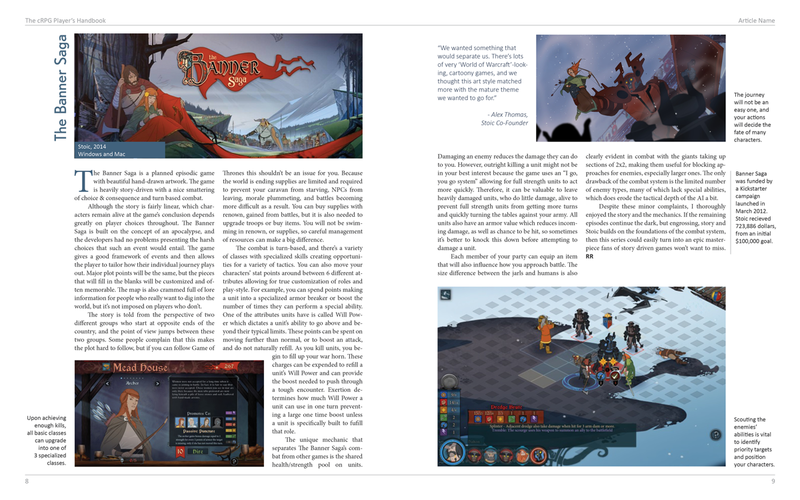 But please note that not every game needs two pages, ok? You can, but don't need to provide the screenshots (in .png if you do, please), just be sure to say what you think is important to show and write the descriptions for the images. They are a good place to point out things that won't fit the main text. The developer's quote will be handled by me (unless you know a good one already). 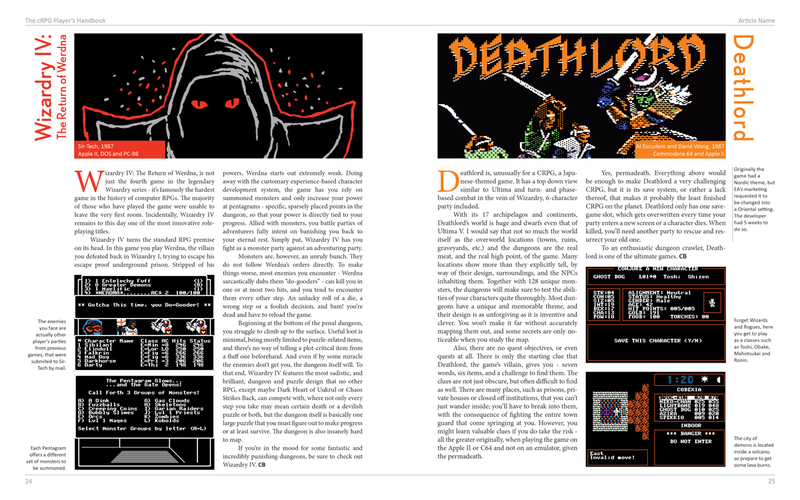 The tone can be somewhat personal, talking about how you stayed up for a whole night trying to map that dungeon in Wizardry 4, but it’s very important that a reader that knows nothing about the game is able to understand what the game really is, its strong points and occasional flaws. Don’t say that “it has great combat”; explain why it’s great. BEFORE starting to write, please post on the thread about what will you do, PM me or send an e-mail to crpgbook at gmail.com. Someone might have already taken the game, or I might have extra details to discuss. Thanks all for your time and sorry for the massive 12/12 Wall of Text. I might write something for you, would you consider Jagged Alliance 2 an RPG? 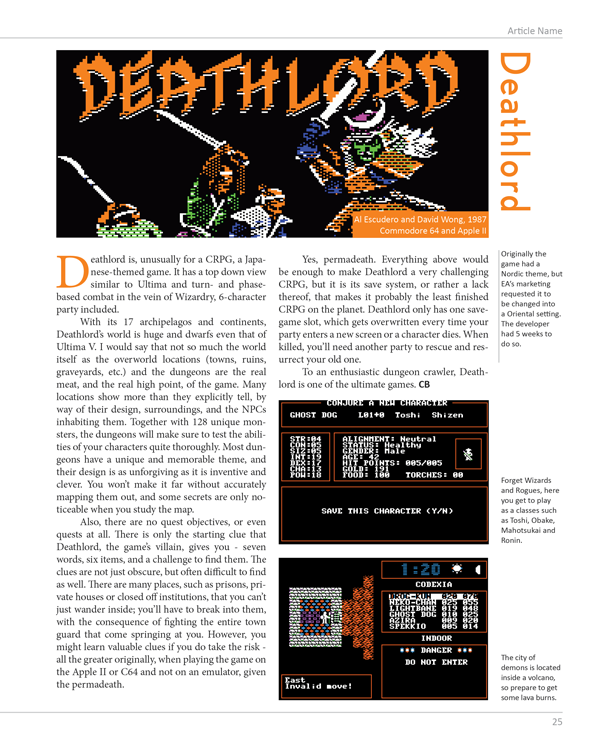 I have an article I knocked out a few years ago collecting digi-dust at the bottom of a hard drive somewhere. Thanks for your interest. Yes, I consider JA2 a RPG (is in the list on the OP), but I already have one of the lead modders behind Patch 1.13 writing the review. Monte is a published author and a fighting in tunnels enthusiast, you should at least take a look at his review before deciding imho. Nice project by the way, I wish you luck with it. Edited by Serrano, 27 May 2014 - 11:40 AM. I'm not gonna auction the reviews based on merit. The JA2 guy took it a week ago, it would be a douche move to go "Oh, I found someone better, don't need you anymore!" I'm sure there is something there you would enjoy. Best of luck with this. Much approved. I doubt I'd be able to write anything though. My time is limited and most of the old-school CRPGs I've played are popular enough to be covered by someone who is no doubt far more qualified than I.
I suppose there's Ishar, but who the hell liked Ishar? Hey felipepe, why don't I bag Fallout: Tactics. Edit - failing that I could write you a freaking book about the politics of Diablo III and I loved the original Sacred. Sir, I am your servant, you choose which one you want me to write. Edited by Monte Carlo, 27 May 2014 - 01:13 PM. I'm not gonna auction the reviews based on merit. You're my agent, aren't you? But seriously, I would like to hear you on Fallout Tactics, for all 4 reasons. But I'm not in any hurry, it will take me months to gather all reviews, so I have no problem with you taking all 3. Edited by felipepepe, 27 May 2014 - 01:38 PM. Hmmm. Well I'll promise you one but I've got a book to write. If I can do more I will, Diablo III lends itself to a short essay on AAA game development and hubris, which go together like beef and mustard. I'm also Paragon Level 100 atm. Nonetheless, right now it's FO:Tactics. Edited by Monte Carlo, 27 May 2014 - 01:23 PM. Great work, I'll definitely get a paperback. Looking forward to some of that "official" input. I hope you disallow a comments section anywhere near the portal to the finished project. If someone is still checking this, we just released a 100-page preview of the book.